↑ http://www.dnh.nic.in, "Dadra and Nagar Haveli government website"
↑ अ आ इ http://bharat.gov.in/knowindia/state_uts.php?id=33, "History of DNH"
↑ http://dnh.nic.in/leave2007.html, "Public Holidays of D&N.H." ↑ "The Official Tourism Website of Department of Tourism, U.T of Dadra & Nagar Haveli, Silvassa - People of Dadra and Nagar Haveli". अभिगमन तिथि 25 फरवरी 2012. ↑ "Visitors guide for Daman, Diu, Dadra and Nagar Haveli" (PDF). "Government of D&N.H and Daman & Diu". पृ॰ 20. अभिगमन तिथि 24 फरवरी 2012. ↑ "Dadra and Nagar Haveli - Industry". अभिगमन तिथि 25 फरवरी 2012. ↑ ""History and Geography of Dadra & Nagar Haveli"". अभिगमन तिथि 25 फरवरी 2012. ↑ "Foreign Settlement in India | Mind of Mahatma Gandhi : Complete Book Online". www.mkgandhi.org. अभिगमन तिथि 1 मार्च 2019. ↑ "How 18th June road got its name". News Blog. Navbharat Times. अभिगमन तिथि 26 फ़रवरी 2012. ↑ "Dadra and Nagar Haveli - Land, Climate and transport". अभिगमन तिथि 12 जून 2012. 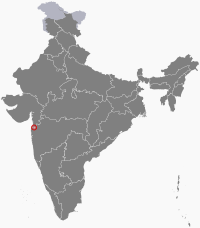 ↑ "SILVASSA Weather, Silvassa Weather Forecast, Temperature, Festivals, Best Season:". tourism. अभिगमन तिथि 13 जून 2012.